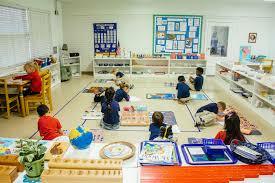 We provide a curriculum designed to give each child the individual attention he or she needs. Sensorial experiences began at birth, and through those senses, the child studies his/her environment. From this, the child then begins to understand his/her environment. Learning language is done by various means, and the child learns at his/her own pace. This allows the child to concentrate on the learning of each important step in language so that each progressive step is done easily. The learning materials also play an important role in aiding the child to develop the powers of communication and expression, of organization and classification, and the development of thought.